What is Four wheel drive (4WD) or 4X4 technology in vehicles? Four-wheel drive (4WD) vehicle is a vehicle that is capable of transferring engine power to all the four wheels. More often, people call these vehicles as 4X4 cars. In this terminology, the first digit represents the number of axle-ends on a vehicle while the second digit represents the number of wheels which directly receive engine power. The wheels which receive power from the engine are also called driving wheels. Therefore, one can say that a four-wheel drive (4WD) or 4X4 vehicle contains 4 driving wheels. Part-time four-wheel drive: This is the first generation of four-wheel drive systems. Usually, such vehicles are rear wheel drive vehicles. Manufacturers convert them to four-wheel drive vehicles with the help of a component called 'Transfer case'. 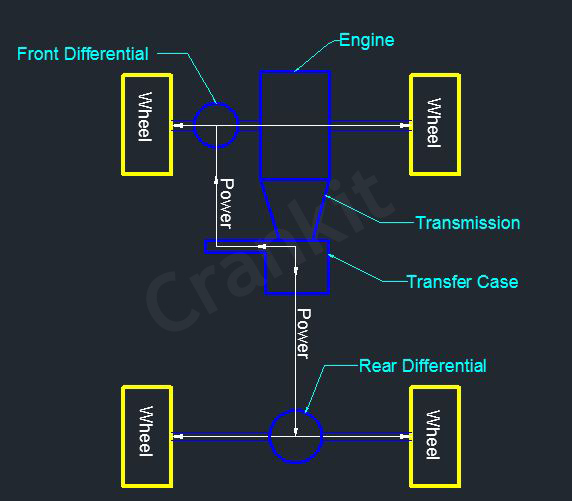 When driver engages transfer case, it transfers the engine power to front wheels also, along with the rear wheels. It is the most simple and cheap 4WD system. On-demand four-wheel drive: Under the normal operating condition, this system operates as the two-wheel drive. However, it can switch over to 4WD mode whenever needed. For doing this, it employs an open differential and the operation is either vacuum or electrically controlled. Full time four wheel drive (4WD): This system works as all time 4WD. Its' operation is fully automatic and it does not need any input from the driver. It uses viscous coupling for torque transfer and thus, can even adjust to individual wheel slips. AWD stands for All Wheel Drive. Technically, an AWD vehicle can be either a full time or part time four wheel drive vehicle. However, according to the recent nomenclature followed in the automotive industry, the manufacturers use this term to refer to full-time 4WD vehicles only. That means in an AWD vehicle, all the wheels will directly receive engine power all the time. Thus, one can say that AWD is synonymous with full-time 4WD. It improves overall stability and grip of the vehicle. It helps to ride on slippery road conditions like mud or snow-covered roads. 4x4 systems are useful for off-roading. The fuel economy or mileage of 4X4 vehicles is generally lower as compared to equivalent two-wheel drive vehicles. As all the wheels are driven wheels, the rate of tyre wear in case of 4WD cars is higher compared to two-wheel drive vehicles. BorgWarner is one of the leading manufacturers of the 4x4 transfer case. For more information, please click here. Home » Technical Anatomy » What is Four wheel drive (4WD) or 4X4 technology in vehicles? How Toyota’s Hybrid Synergy Drive (HSD) Technology Works?